Samantha Sunshine is an innovative body worker, yogini, mermaid, lifestyle coach and teacher. She is a licensed massage therapist, certified in AcroSage™ and Thai Massage, and a certified Hatha Yoga instructor through Yoga Alliance. Samantha is passionate about healing personally and collectively. She grew up skiing, snowboarding, and mountain biking in Vail and in 2015, resettled and founded the Sunshine Massage Studio. Samantha Sunshine's exposure to life-changing massage began with meeting Benjamin Marantz, the originator of the AcroSage™ technique while touring the Big Island on bicycle. After receiving her first AcroSage session, she knew she wanted to share the surreal experience with everyone she met. She quickly became one of Benjamin's most enthusiastic students, and went on to co-produce and co-author the updated AcroSage instructional manual & DVD. Inspired by the freedom and creativity of Marantz, Sunshine branched off and started creating her own modalities. Since mastering the AcroSage™ technique, Samantha created Yogasage (the fusion of a yoga vinyasa practice with a compassionate deep tissue practice), Aerial Yogasage /Aerial Silk Massage (the fusion of aerial yoga, and a deep tissue massage practice), Yoga Swing Massage (massaging a client while inverted in an omni-gym padded yoga swing), and inevitably Sunshine Therapy™- (the accumulation and total fusion of all her massage inventions). She also combines mind reprogramming, sound healing, and breath-work in unique ways throughout her sessions. To schedule a massage or private yoga session. To purchase massage gift certificates. For questions regarding yoga classes, acroyoga & events. 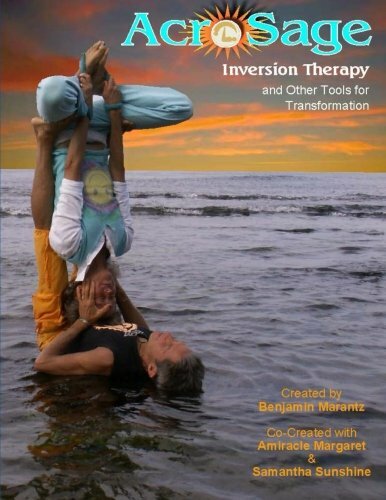 For questions regarding Inversion Therapy and AcroSage™. To request cross-promotion or affiliate marketing with Sunshine Massage Studio.